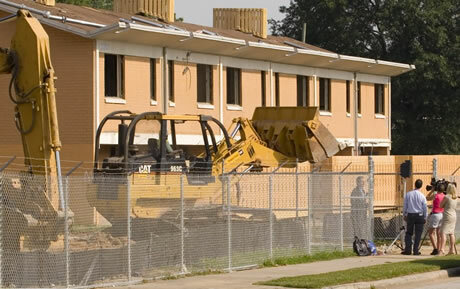 When Atlanta Housing Authority bulldozers ripped into Bowen Homes in early July, they destroyed more than the 950 units of public housing on the city’s west side. It also brought an era to an end. The first city in the country to construct public apartment complexes as part of the 1930s “New Deal” is now also the first to completely eliminate planned, subsidized housing. Echoing elites in other cities anxious to wipe public housing off the map, local media has framed the demolition as a victory against “crime” and “concentrated poverty.” Left out of the soundbites is a far more complex reality. For seven decades, tens of thousands of units of public housing were a vital safety net, a center of community organizing, and a political battleground between market based or social visions of the city. Public housing played an integral role for generations of Atlanta’s working class, especially the African-American majority. In the 1930s, conditions in Atlanta’s communities dramatized exploitative and degrading conditions suffered by those who had labored to construct the New South boomtown. White working-class neighborhoods and milltowns such as Cabbagetown, Bankhead, and Fifth Ward had unpaved roads, unsanitary or nonexistent sewers, and low-quality housing; conditions in Black slums like Vine City or Buttermilk Bottom were even more appalling. Many of the white tenants at Techwood Homes – the first public housing in the United States upon its construction in 1936 – hadn’t previously experienced indoor plumbing, insulation, or even electricity. The following year, developers leveled a slum bordering Clark Atlanta University and Spelman College to build the 635-unit University Homes, a segregated Black project, bringing attractive brick apartments and courtyards to the African-American population. By the 1960s public housing had been de-segregated and construction of new projects reached a high point; Techwood and University Homes would eventually be joined by 38 other projects scattered throughout the city, though concentrated in the southern half. Some of the largest, like Bowen Homes included elementary schools or other amenities on-site. By the end of the decade, as the Civil Rights movement increasingly centered on the concerns of the urban poor and their demand for Black Power, strong public housing neighborhood associations became a bedrock of this activism. Reflecting the trend of the nationwide Welfare Rights movement, African-American women leaders emerged as central organizers. One of the most important examples was the National Domestic Workers Union, founded in 1968 by Dorothy Bolden and residents at Perry Homes. Bolden and other maids overcame legal barriers (the National Labor Relations Act prohibits domestic workers from collective bargaining) and the lack of a central workplace to organize by building at the community level and on buses. Within ten years, their efforts had won a minimum wage, Social Security, and significant improvements in daily pay. Perry Homes and other projects in northwest Atlanta would also be central in the successful fight to extend the city’s public transportation system, MARTA, to an east-west axis rather than merely serving the northern white neighborhoods with rail lines. In the realm of electoral politics, get out the vote efforts in public housing were key to defining an era of a Black political class in the city – a major democratic victory, despite the mixed loyalty of these politicians. However, beyond the control of even the strongest community organizations, corporate profits hit a wall in the 1970s, leading to a brutal restructuring of the economy – with dire consequences for marginal urban populations dependent on the public sector and transit-accessible jobs. The declining tax base of the city and persistent housing discrimination limited African-Americans to the most affected urban neighborhoods, with underfunded services and limited job opportunities. Well-paying jobs disappeared as capital investment shifted to distant suburbs; Maynard Jackson, the first Black mayor, crushed a sanitation strike to indicate his hostility to demands for humane wages and conditions for city workers. By the 1980s Atlanta had the nation’s highest concentration of public housing; almost 10% of all units in the city were subsidized. But out of more than 50,000 residents, only one in twenty had reliable employment. 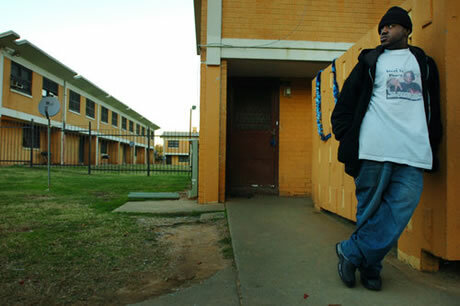 Residents faced other problems, as well; in 1989 the FBI reported that the city also had the highest crime in the United States, often flowing from drug activity in vacant public housing units. Citing crime, services and utilities – including the USPS – briefly ceased operation in some projects. Poor maintenance and sanitation inflamed health issues; in one high-profile case in 1996, a child choked to death on a cockroach. Although some community leaders (such as Grady Homes resident Susie LaBord) won voting seats on the Atlanta Housing Authority board, most decisions were out of reach of those who actually lived in public housing. Despite the symbolism of Black political stewardship, the fundamental lack of political power for African-Americans facilitated a long process of declining quality that foreshadows the outright demolition of public housing and relocation of project residents. Like a magician’s smoke and mirror show, city elites planned a comprehensive urban renewal program behind the sparkle of the 1996 Olympic Games bid, including the first wave of public housing destruction. Techwood and Clark Howell Homes were partially razed to make way for Centennial Olympic Park and athlete dormitories; in other areas of the city strategically sought HUD grants and infusions of private funding knocked down nine large projects and replaced them with “public-private partnership” complexes. Major developers lent funds to this battering ram process and more and more areas of the city were opened up to gentrification. Federal policies of the Clinton administration exacerbated the crisis of public housing in Atlanta and other cities. Similar to Clinton’s war on welfare and creation of exploitative “workfare” programs, a “carrot and stick” approach used a dual set of tactics to remove public housing and relocate tenants. The Hope VI program, for example, mandated the creation of “mixed-income” developments in place of public housing, without ensuring spots for former low income residents, and with strict eligibility requirements for those who tried to return. Section 8 vouchers were offered (or forced) on residents to lure them into the private housing market. Meanwhile, zero-tolerance, “one strike” codes provided the stick: forced eviction of tenants at the first criminal offense in their unit – even if the crime was committed by a family member or guest. Communities in remaining public housing were gradually dissolved. 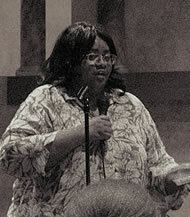 By the time the complete elimination of Atlanta’s public housing was announced in 2007 (in the midst of the housing bubble), a coalition of resident leaders such as Bowen Homes’ Shirley Hightower and allied groups like Georgia Task Force for the Homeless and Jobs with Justice waged a last ditch campaign to save and revitalize the remaining units. But, disorganized and demoralized, public housing residents were unable to turn the tide of closures. The ideas of “New Urbanism” that underlie these programs fit neatly into the general shift towards neoliberalism: state programs to enforce a dictatorship of the market, promote privatization, and reduce the capacities of those affected to resist. Rather than elimination of poverty – which is inherent in capitalist economies – the goal would be to “deconcentrate” the poor. This false solution, in addition to its dehumanization of poor people, obscures some fundamentally social realities by presenting shelter as a matter of individual choice (facilitated by the market.) Public housing is just one part of a matrix of inter-dependent public services: public sector employment, transportation, health care, and education. “Deconcentration” minimizes the social power of those who use social services – in this case, housing. Since the 1960s, African Americans have won greater access to state jobs, where affirmative action programs have been most effective. But this concentration of employment led to vulnerability when those jobs were eliminated. The dismantling of the nearly the entire public sector, therefore, cuts from all sides: harming working people in their capacities as employees – and as human beings with needs and social rights to health, education, transportation, and shelter. Mass relocation of public housing tenants takes away not only geographically neutral affordable housing, but often access to transportation and other necessities. Migration patterns in the metro Atlanta area show ongoing gentrification of intown neighborhoods that shoves poor, Black residents to commuter suburbs with virtually non-existent public infrastructure. Public housing also reflects the “feminization of poverty.” A pre-relocation survey of public housing residents in Atlanta found that over 95% of leaseholders in family units (as opposed to elderly units) were African American women. Most reported short tenures with AHA, having been driven there due to poverty wages or family breakups. Outside of those immediately affected, the loss of public housing forced all those struggling with rent or home payments to shoulder the load of profit-based housing. Rapid destruction of thousands of subsidized units destabilized Atlanta’s housing market, fueling increased rents and across the city, while the housing bubble detonated in a wave of mortgage foreclosures. Under pressure from the same forces of gentrification, the “last ditch” homeless shelter operated by Task Force for the Homeless, Peachtree-Pine, was evicted from its building, making the housing crisis more acute. 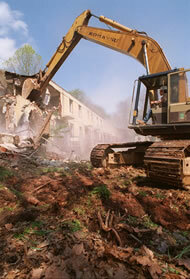 The demolition of Atlanta’s public housing is a huge loss. But like Santiago in The Old Man and the Sea, the working class may face destruction, but has not been defeated! The seeds of a renewed movement to assert socially provided shelter and community can be found in today’s scattered anti-eviction activism; the international legacy of housing and land-based activism of provides an arsenal of inspiration and strategies. At meetings I attended in Bowen Homes a few years back, residents responded to the threats of the Housing Authority with their own dreams of quality, community-controlled projects: putting tenants to work on the numerous maintenance jobs, winning grants for day cares, community gardens, and sports programs, and more that I’ve surely forgotten. The creativity and determination of residents to not just maintain, but improve their communities showed the important ingredient of imagination and a fighting spirit. It’s up to us to construct a movement that can be put at the service of these dreams, and make them real. Color photos from a horribly-titled photo gallery inThe Atlanta Journal-Constitution. Great and refreshing article, especially considering how hard it is to find coverage of the demolitions in the local media that isn’t shamelessly glowing and one sided.